boldness, and is an asset in the acting profession because an actor needs to be the opposite of shy! Emoting in front of strangers must have come naturally to Denzel because he can do it without being self conscious. When noting the changes that took place in Denzel Washington's personality as he grew older, it is important to examine his hands when he was younger (which I have done) because the left hand too can change and then it becomes difficult to note any inherited characteristics. I also strongly suspect that Denzel's right thumb is longer than the left, but could not confirm it from photos. Check out a hand photograph of his here. What makes Denzel different from the other Hollywood celebs is perhaps the fact that he was not born with a silver spoon in his mouth, and nor is he the typical narcissistic attention seeking personality. He is heart a simple guy, without the layers and masks. What you see is what you get. That is very clear from the lines and the shape of the hand and fingers. 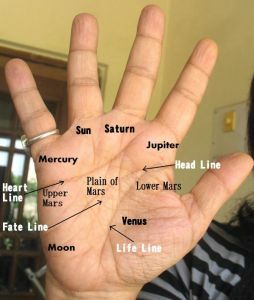 The thick, deep lines may not show someone who is an intellectual but the broad palm, the large Moon Mount, the long first and second phalanges, long low-set thumb, long and straight Apollo finger, and the overall clarity and depth of the lines speak volumes. They tell us of a man who is talented, strong, focused, a natural leader, disciplined, and also compassionate. The phalange lengths and shape, plus the firm texture of his palmar skin add to the reading. (Denzel Washington is an American actor, film director, and film producer. He is African American). You might also like to read Hugh Jackman's hand reading or Michael Jackson's hands reveal his strengths and weaknesses or Ben Affleck's Hand Reading or Jennifer Hudson's hand reading or Julia Roberts. I guess one can tell these things about actors, in spite have having watched them only in movies! For some reason, I (who has watched so few English movies) too have a good opinion about this actor. Not sure if the kind of roles he takes has to do anything with it. Have you read the hands of Will Smith and Tom Hanks. Those two are other Hollywood actors that I respect a lot (don't know why!). I guess Denzel Washington is a good actor like Tom Hanks and Will Smith for example. I have not read their hands, but probably will one of these days. What is interesting about DW is that he hardly comes in the news! A low profile actor. Such people are always interesting because they are a little mysterious! What do really deep lines mean? Deep lines intensify the meaning of each line.